Call 1 844 942-2654 or click to learn more about Medicare coverage and product availability. 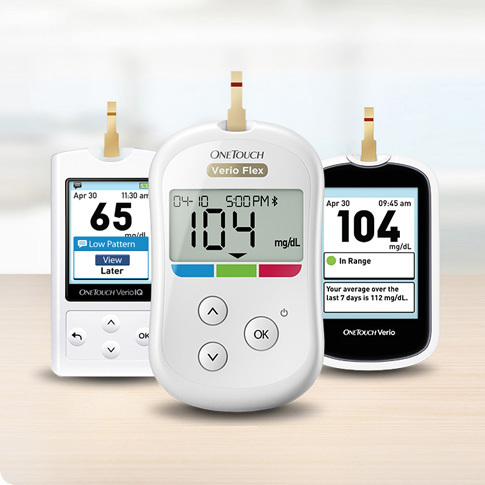 We make it simple to order samples, so you can help your patients choose the right OneTouch® meter. Ask your patients to complete the OneTouch® offer form, or you can download the voucher and share it directly with your patients. *This program only works with pharmacy benefit coverage that does not cover OneTouch® test strips. †Some health plans may have more than one test strip covered at the lowest co-pay. ‡Coverage and payment subject to co-insurance, deductible and patient eligibility requirements. LifeScan does not guarantee coverage or payment. §Among all branded and value manufacturers. Symphony Health Retail Pharmacy Claims Data Jan-Dec 2015. Plan types include Commercial, Medicare Advantage and Managed Medicaid. ||Based on a study conducted in 2015 in the UK of 40 patients with Type 2 Diabetes using a simulated model of the OneTouch Verio Flex™ meter.